A new product being provided by one insurance company will finally help prove that using cell phones in cars is causing crashes and should be stopped. More importantly, the device can also stop texting and calls in cars. It is put-up or shut-up time in America when it comes to ending distracted driving due to cell phones. 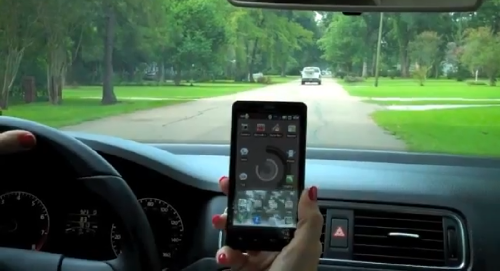 Arbella, an insurance company based in Massachusetts, is now offering to its customers a device that can stop a cell phone from working when the vehicle is in use. Just to jump ahead, yes it does all things you are already imagining that such a device should do and it is basically free. All of these are urban myths in America. They have been disproven not only by the National Highway Transportation Safety Administration (NHTSA) and Department of Transportation, but also by the Insurance Institute for Highway Safety (IIHS). Is it bad to text and drive? Of course. Has the government or any independent agency found that the problem is increasing? No. In fact, they have both found the opposite as we have previously reported. Mr. Donahue is right that about 10% of roadway deaths are attributed to distracted driving. However, only about 1.5% were directly related to cell phones according to NHTSA. Also, it is hard to call that an epidemic, particularly since in recent years those numbers are declining, not increasing. Nonetheless, this new program by Arbella will provide a very valuable set of data that can show either a reduction in the amount of accidents and deaths in vehicles in which hand-held devices could not possibly have been the cause, versus a control group selected at random of accident rates and death rates from vehicles not equipped with the devices. We suspect that the group with the devices will prove safer. However, the conventional wisdom has been wrong on this in the past. For example the IIHS and its affiliate group, the Highway Loss Data Group (HDLI) did an exhaustive study of states like California that enacted texting/cellphone bans. The study looked only at states that had a very similar control group state nearby that did not enact such laws. After a statistically meaningful period of time had passed, enough to allow enforcement to have taken affect, the two types of states were closely compared. HDLI and IIHS proved that the states with the bans did not see any overall reduction in crashes or deaths. Adrian Lund, president of both the Insurance Institute for Highway Safety and HLDI summed the study up simply, saying "The laws aren't reducing crashes, even though we know that such laws have reduced hand-held phone use, and several studies have established that phoning while driving increases crash risk.” Lund went on to say “So the new findings don't match what we already know about the risk of phoning and texting while driving. If crash risk increases with phone use and fewer drivers use phones where it's illegal to do so, we would expect to see a decrease in crashes. But we aren't seeing it. Nor do we see collision claim increases before the phone bans took effect. This is surprising, too, given what we know about the growing use of cellphones and the risk of phoning while driving." Please read the report for yourself before writing your angry-gram below. The big difference here is that the Arbella group of cars cannot ignore the law since the cars will not allow the devices to work regardless of if the driver chooses to do the wrong thing. If the Arbella study group does prove a reduction in crashes and deaths, it would be hard to argue that such devices should not be mandatory in all vehicles, including all municipal vehicles, police vehicles, and government vehicles. Remember, safety calls can always be made, and the devices always work when the vehicle is stopped. The really interesting part of this new device and program will be the conversations within families. If you have children, as this author does, you know full well that “do as I say, not as I do” stops working about age 4. (It only works for about 15 minutes anyway) Telling a teen that only “they” are incapable of using a phone in a car, while mom and dad, being superior life forms, are able to do so safely, will lead to some explosive laughter. Particularly, if the teens have access to this link, which shows that a study by the US Department of Transportation, published April 2013, proved that those under 24 are only about 2% more likely to be using hand-held device in cars than are older drivers adults. It may be better to let Dad lead the conversation too, since the same study showed that about 4% of males use hand-held devices while driving, while females are higher at 6%.